The next of the 8 extra channels we will look at is the Yin Wei Mai 陰維脈. 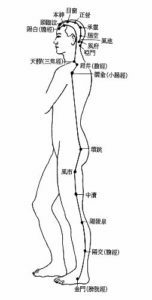 This starts inside the calf at the Zhu Bin 築賓 point, rises up the leg to the stomach, passing through the chest to the Tian Tu 天突 finishes at the Lian Quan 廉泉 point under the chin. Yin Wei Mai means connect with the Yin Mai or Yin Jinglou 經絡 (channels). Yin is inside and so the channels inside the legs and also the chest area which is also Yin. If we have a Yin Wei Mai then we must also have a Yang Wei Mai 陽維脈. 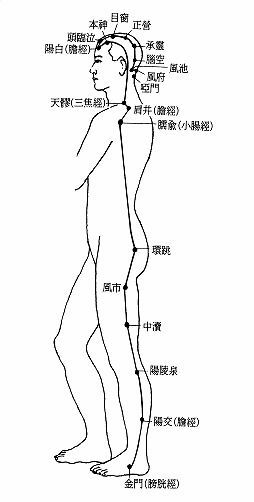 This starts at the Jin Men 金門 point, on the outside of the foot and goes up along the outside of the leg to the hip and the Haun Tiao 環跳 point. From there it continues up along the side of the back to the Jian Jing 肩井 point and then passes behind ear and then onto the forehead to the Yang Bai 陽百 point. 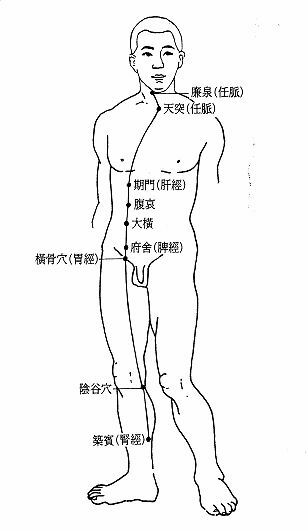 Then go to the top of the head and then down the back of the head passing the Feng Chi 風池 and Feng Fu 風府 points and ends at the Ya Men 啞門 point. This Mai is very interesting. It goes from the foot, along the side of the back and then reverses to the back of the head going almost down to the neck. More Qi is needed to make this Mai smooth as it is so long. Any long Mai or Jinglou requires more Qi to make it flow smoothly. 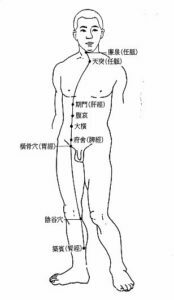 The Yang Wei Mai connects the Yang parts of the body. Together the Yin Wei Mai and the Yang Wei Mai cover the inside and outside of the body the Yin and areas.